Using a cordless upright vacuum cleaner has many advantages. Clearly, the most obvious ones are that you don't have to worry about a long cord wrapping around chair and table legs or getting your feet entangled, and you don't have to worry about having to stop to re-plug the power cord when moving from one area to another. Thus, in larger homes, cordless units can speed up the cleaning process. Another benefit to cordless vacuum cleaners is that they are usually bagless. Cordless vacuum cleaners make use of a detachable dirt collection chamber which is simply emptied each time it gets full. Not needing any replacement bags helps saving quite a bit of money in the long run. Note also that most of these cleaners do not need replacement filters, as their filters can be simply cleaned or washed after use. More savings! Finally, most cordless vacuums are sleek in design and weigh much less than corded units. This is particularly important to people with not too much strength as they can accomplish the vacuuming task with ease and without having to over exert themselves. There are all types of cordless vacuum cleaners, and some can be acquired at very low cost (less than $50). But for cordless units to clean as effectively as corded models, they must be equipped with powerful batteries, and usually, the cheap models will have weaker batteries and weaker suction power, and therefore will not do as good a job as corded units. Cheaper models may also not last for a long time due to lower quality. This review will compare the Hoover Linx and Dyson V8 cordless stick vacuum cleaners. These units were the top sellers in the cordless upright vacuum cleaner category among Amazon buyers at the time this review was written. They are high quality products equipped with powerful rechargeable batteries. The various versions of cyclonic technology built into these machines spin the air at incredibly high speeds inside them, generating centrifugal forces many times larger than the force of gravity. As a result dust, dirt and pet hair are all sucked in at tremendous speed, and flung out of the airflow straight into the dirt bin. There is no loss of suction, and there is no needs for bags. You will find below detailed descriptions and a comparison of the two selected vacuum cleaners. Selected Cordless Upright Vacuum Cleaners on Amazon. HEPA stands for "High Efficiency Particulate Air" and is a filter grade defined by the US Department of Energy which requires the filter to be able to remove more than 99.97% of allergens, pollen and particles as small as 0.3 micron. Hoover Linx and Dyson V8 will vacuum effectively all floor types, whether carpet, vinyl, tile or wood. Dyson V8 comes with a docking station that can be used to store and charge the machine, and holds additional attachments. The battery run time for Dyson V8 is 40 minutes on normal setting and about 7 minutes on the max suction setting. ​The battery run time and charging time for the Hoover Linx are all based on Amazon customers’ information, as the specs for this unit do not specify this information. 180-degree swivel helps users maneuver easily the unit around different hard-to-get-to areas of their home. Though the Hoover Linx does not have the 180-degree swivel feature, it has a narrow base for easy maneuvering through small spaces. The only thing that comes with it is the battery, the charger and one filter. As this unit was designed primarily for floor care and not for upholstery, you don't need any other accessories. However, it could also be used on the stairs as it is very light weight and has good suction. For exact Amazon prices for these cordless vacuum cleaners, please refer to the Amazon section below. 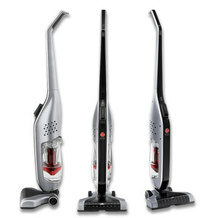 With its proprietary WindTunnel cyclonic cleaning core, the Hoover Linx cordless and bagless stick vacuum cleaner uses the power of rotating brushes and three suction tunnels to lift and collect dirt. The power brushes are able to pick up dirt even in thick plush carpeting, and the one-touch switch on the handle turns off the brushroll, transitioning easily the unit from carpets to bare-floor surfaces. The 42 inch tall and 7-1/4 pounds lightweight unit runs on a rechargeable 18-Volt lithium-ion battery which ensures maximum power right up until the battery is thoroughly emptied. The battery is equipped with a fuel gauge that indicates clearly the amount of battery life remaining, and the included battery charger quickly powers it back up to a full charge. 11 inch-wide nozzle with a wide-mouth opening. Edge cleaning bristles for better cleaning of baseboards and corners. Reclining comfort grip handle for access under furniture. Narrow base for maneuvering through small spaces. Ability to stand upright on its own without needing to lean against a wall for convenience and storage. The unit carries a 2-year limited manufacturer's warranty. With its proprietary patented cyclonic technology, the cordless and bagless Dyson V8 Animal vacuum cleaner provides more suction power than any other lightweight cordless vacuum cleaner, making it the most powerful cordless unit available. It is ideal for quick, flexible cleaning of all floor types (carpet, vinyl, tile and wood), and it adapts easily for cleaning with no hassle stairs, upholstery and car interior. The unit is equipped with two types of brush heads: a soft-roller cleaner head that removes large debris and fine dust simultaneously from hard floors, and a direct-drive cleaner head that can drive bristles deep into the carpet to remove ground-in dirt. ​The 47 inch tall and 5.7 pounds lightweight unit runs on a rechargeable lithium-ion battery that can provide 40 minutes of cleaning time on normal setting and about 7 minutes on the max suction setting. Detachable long-reach wand made from lightweight aluminum that can reach high, low and into awkward spaces (it can be detached so that the machine can be used as a handheld cleaner). Docking station to conveniently store and recharge the unit when not in use. Dual power mode that gives you the option of 40 minutes of constant high suction or 7 minutes of max suction for more difficult tasks. Crevice tool for detailed cleaning in tight spaces and a combination brush/wide debris nozzle tool to clean upholstery and furniture. Transparent dirt bin, so you can see when it gets full and needs to be emptied. The bin can be emptied with the push of a button, minimizing the risk of contamination from dirt. If you don't want to pay the higher price of a Dyson V8, you might want to consider the Dyson V6 cordless vacuum cleaner. It comes with almost all the nice features that the Dyson V8 comes with, except that at full charge it runs for about 20 minutes, and instead of coming with 2 brush heads like the Dyson V8, it comes with a single motorized brush head that cleans all floor types (carpets and hard floors). Given its much lower price, Dyson V6 is worth serious consideration. To check exact prices for both Dyson V8 and V6, please click the Amazon product links provided here. So which cordless vacuum cleaner is best to buy? Hoover Linx and Dyson V8 will vacuum effectively all type of floors, even plush carpets. Dyson V8 has a stronger battery, and it comes with a boosting feature that increases the suction power for cleaning tougher spots. It also has the longest run time at full charge when run in normal mode (with no boosting). Dyson V8 is the only one that comes with a docking station that can be used both to store and charge the unit. ​Only Dyson V8 is equipped with a HEPA grade filter. 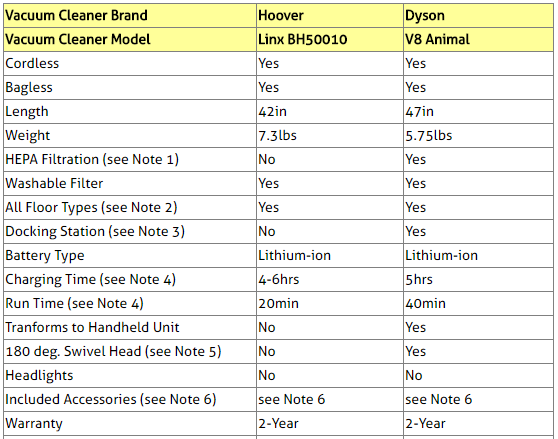 Dyson V8 transforms easily into handheld units to vacuum upholstery and above floor areas, while Hoover Linx does not. Because both products perform quite well, your choice should really depend on the features offered by each of these machines which differ to some extent and which are described in the previous sections. If you are looking for a lightweight yet powerful cordless unit that comes with all the features you may ask for, then consider the Dyson V8. However, if cost is an important factor for you, you will not be disappointed by Hoover Linx as long as the features listed above for these units match your homes's vacuuming needs. Note that at the end of this article, we also present the Hoover Air which is a more powerful cordless vacuum made by Hoover you may want to consider as well.